ELV, a quinquagenarian par excellence, doesn’t make a big deal over anyone’s birthday. Like humorist Dave Barry, he thinks no one over the age of eleven should celebrate the day they were born. But he makes exceptions for world class French chefs celebrating one of theirs, and announcing their arrival in Vegas — bringing their precise and delicious French bourgeois cooking to our humble burg. Such was the case with Michel Richard two weeks ago, inside one of those $40,000/night suites at Caesars — set aside to celebrate his b’day and the announcement of his taking over the Augustus Cafe near the Caesars’ check-in desks — turning it into a Vegas branch of Richard’s much-lauded Central in Washington D. C.. Eating Las Vegas considers this a smart move by all concerned. The Augustus Cafe is moribund, barely visible, and always empty despite being in one of the highest traffic areas in all of Caesars. Giving it an identity will certainly resuscitate this no-man’s land and, oddly (we’re guessing) give a boost to Restaurant Guy Savoy as well. 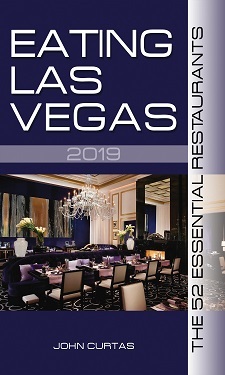 Having an association with two world-famous French chefs, and superb food at two price levels, within a stone’s throw of each other, will be a win-win the Wynn/Not Winning can only wince at. French bistros are back (obviously) and ELV is happier than a pig in profiteroles. We’ve eaten Richard’s food at Citronelle (both in Santa Barbara and Washington), and Central (a few years ago) and never been less than wowed by the high level of cooking (very, very French, running the gamut from haute bistro to outstandingly inventive). Richard cut his teeth as a pâtissière, so desserts should be out-of-this-world as well. Expect an opening in late summer, and ELV to be tucking in to a calves liver with bacon, or a hangar steak au poivre, shortly thereafter.